Creating a forum is a very good idea for your blog, it's a platform were all your visitors interact and discus some serious topics. In most forums your visitors can create the own topics and also solution will give to them there isn't that great and this will make your blog visitors to know how serious you are. Today I will Be given a tutorial which Will be much helpful to you even to those around you so let's start. 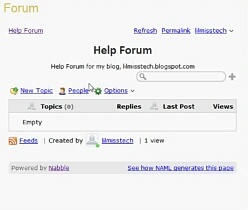 To be able to add the forum into your blog you will have to visit nabble homepage and then create an account with them and you should remember that your account is also the same as your new forum. After you have create the forum you will have to do some little customization you just have to click on option then application and change appearance. Now after that you will should also edit the CSS of your new forum and if possible change your password so to keep is save from hackers. Create a category for your forum click option => Structure=> Create a new sub forum then you will have to fill a form with your details then you are almoat through. Now go to the embedding option and copy the HTML code there. Now goto you blogger dashboard and select the blog you want to perform this on. Create a new page then click on HTML it is located at the top left corner of the page. Paste the code and click on publish. Forums are great idea for a blog it allow a have your say platform and also generate follow through discussion which might be a solution for other people on searching for similar subject matter. it was that simple and i thing it will be a fun practicing. Thank you. tell me whether it is spam free ? Is it good to name the page FAQ's or DISCUSSION ? Thanks bro for this. Appreciate. Bon post. J'aime beaucoup votre blog et vous lire. Merci pour ces moments de partage.